2 nights accommodation at Singapore. 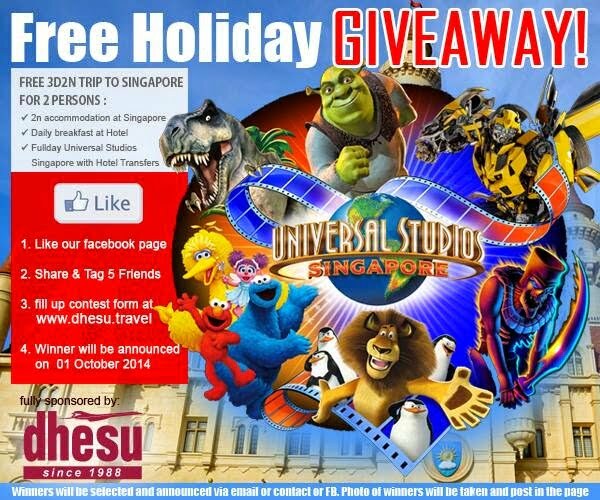 Full Day pass to Universal Studio Singapore with hotel transfers. Share this contest on your Facebook, and don’t forget to tag 5 of your friends. Fill up the contest form at Dhesu Travel & Tours website (make sure your browser doesn’t block pop-up). Winners will be selected and announced on 1 October 2014 via email/contact/Facebook. Photos of the winners will be taken and post on their Facebook page.